Satisfy you sweet tooth like the Parisians do at this Epcot pastry shop. The Guide2WDW staff loves the pastries of France that are offered at Les Halles Boulangerie & Patisserie. We try to never miss this recently expanded bakery whenever we visit Epcot. For me, this pastry shop is perfect for a late breakfast, since it opens at 11AM. Nothing is better than starting the day with a Strawberry Tart at Epcot. Just head to the very back of the France pavilion for baked perfection. Tip: The same quiche and creme brulee that are served at Chefs de France are also served here at a savings. 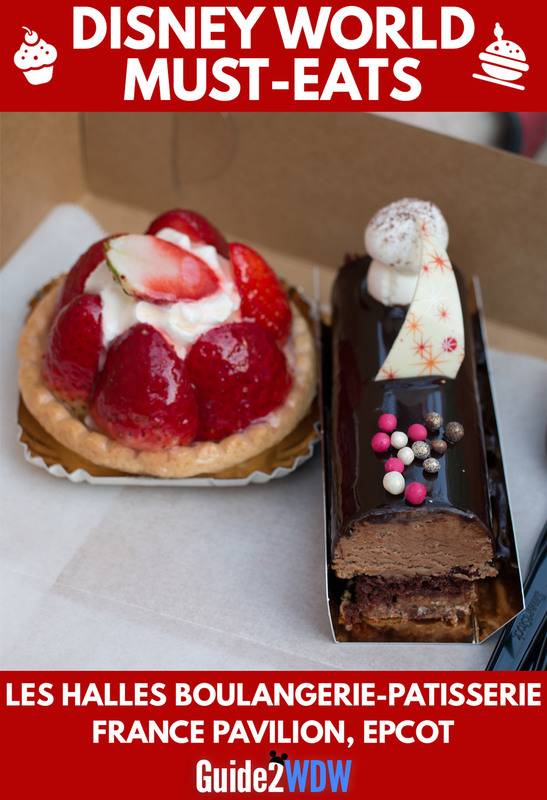 Tip: Be sure to check out the Napoleon, the best selling item at Les Halles Boulangerie & Patisserie. Note: Menus for Disney World restaurants change on a somewhat regular basis, so the menu listed above is subject to change. For the most up to date menu, check out Disney’s official Les Halles Boulangerie & Patisserie menu.